In most effects involving a lot of dealing into piles, the dealing is a source of tedium. In this case, the dealing is the source of the entertainment value. Of course, this will only be the case, if you develop the presentation properly. As long as you're clear on the presentational premise, you'll find that the patter will evolve over the course of repeated performances. In fact, you'll get many of your best patter lines from the spectators themselves. If a spectator says something during the effect that gets a laugh, remember it. Odds are that it will get a laugh if you say it the next time you do the trick. Since you're going to be pattering throughout the dealing process and interacting with the spectators, you may occasionally stop in mid-deal to deliver a line. It's important that you don't lose your place. If, for example, you've just dealt a card to the spectator's pile, stop to talk, then resume by dealing another card to the spectator's pile, you'll be in big trouble. The way to avoid this is simple. If you're going to pause, only do so after dealing a card to yourself. That way you know to always resume by dealing a card to the spectator. # Always do this for a group rather than a single individual. You don't want somebody trying to win some money by lying about the identity of his or her card. As long as you make sure that the rest of the audience sees the card also, this won't be an issue. 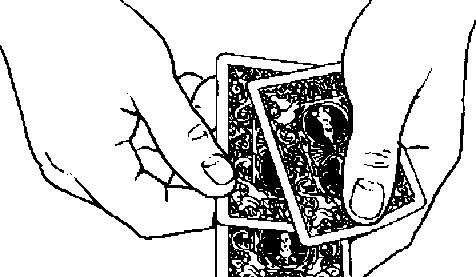 & You don't have to be a magician or a mathematical genius to realize that which card ends up in front of the performer is determined by the starting location of that card in the deck (although they may not know what the necessary starting location is). What makes this effect baffling is that the spectator determines, not only the identity of the card, but also its location. Wherever he stops you, that's where the card remains. One of my performing dictums is: make the unimportant seem important and the important seem unimportant. In this case that means, make the audience remember that you never shuffled, cut, or otherwise altered the positions of the cards. Make them forget that you aborted the first deal. If you follow the presentational suggestions in the main description you'll have no trouble accomplishing either. # Unlike the other three memorized stack effects in this book (The Last Laugh, The Zm Master, Remote Cimtrol), you won't be able to return to your original stack order at the end of this trick. Some magicians will iind this a scary thought. I believe that the most effective way to use a memorized stack is to perform only one or two effects with it. Then shuffle the cards and move on to other things. Repeated use of the principle can produce a certain sameness of effect. Overuse can also provide a clue to the method. In this regard, a stacked deck is similar to using gaffed cards. One or two gaffed effects slipped into a performance of tricks with ordinary cards can be devastating. One gaffed effect after another is risky and unsubtle. Unlike gaffed cards, however, a memorized stack take9 work to master. Many magicians feel that, "If I worked that hard to learn it, I'm going to get as much mileage out of it as possible." It may also take work to get your stacked deck into play. You may think, "Now that I've finally managed to get it into play, I'm going to keep it in play as long as I can." It's also true that once you destroy the stack, there is no turning hack. Saying to the spectator. "Shuffle the cards," means letting go of your security blanket. The alternative, however, can lead you to build your performance around the goal of preserving your stack rather than the goal of maximizing audience impact. If you see yourself in this description, i suggest you try to get over your separation anxiety. A performance of card magic built around pure sleight of hand with just one or two gaffed effects and one or two stacked effects can be devastating. Used this way, the memorized stack becomes truly subtle and powerful. Obviously, you don't have to agree with what i've just said in order to benefit from the memorized stack effects in this book. Consider it lood for thought.